2019 Gift Ideas Relax with cozy cabins, lovely interiors, and peaceful country scenes with this charming coloring book from bestselling publishing brand, Jade Summer. 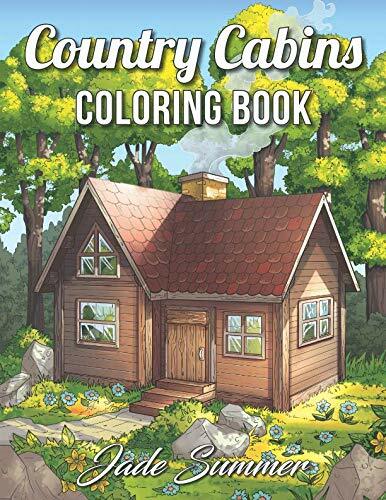 Our Country Cabins Coloring Book takes you on a relaxing trip into nature. Enjoy coloring a variety of small houses and the beautiful landscapes that surround them. We have packed this gorgeous coloring book with many realistic details. In addition to outdoor scenes, we have also included delightful interior coloring pages full of country charm! You get to color a rustic cabin next to a gently flowing river, a mountainside cabin overlooking an evergreen forest, and even a tiny cabin on its own little island. If you love spending time in the country or have a passion for interior design, you will love going on this coloring book adventure! Why You Will Love this Book Relaxing Coloring Pages. Every page you color will pull you into a relaxing world where your responsibilities will seem to fade away... Beautiful Illustrations. We’ve included 25 unique images for you to express your creativity and make masterpieces. Which colors will you choose for this book? Double Images. You get to color your favorite images a second time, have an extra copy in case you make a mistake, or have an extra page to share with a friend. Single-sided Pages. Every image is placed on its own black-backed page to reduce the bleed-through problem found in other coloring books. Great for All Skill Levels. You can color every page however you want and there is no wrong way to color (even if you are a beginner). Makes a Wonderful Gift. Know someone who loves to color? Make them smile by getting them a copy too. You could even color together! About Jade Summer 100+ Coloring Books. Explore the entire Jade Summer collection and find an amazing book for your next coloring adventure. As a Jade Summer fan, you have access to books in a variety of popular themes, including animals, mandalas, fantasy, inspirational, and many more! 6,500+ 5-star Amazon Reviews. Jade Summer is one of the premier coloring book brands and a frequent bestseller on Amazon. When you buy a Jade Summer coloring book, you know it's a product you'll love. Fun Online Community. Our fun, friendly, and supportive community on social media is an entertaining way to view completed pages from other Jade Summer fans, meet other colorists, and share your masterpieces with the world. Buy Now &amp; Relax... Scroll to the top of the page and click the Add to Cart button.